We were successful in our tender to create the 2D character animation for a new mixed media pre-school series commissioned by BBC Worldwide and CBeebies. Consisting of 52 x 5minute episodes, we follow ‘Kit & Pup’ as they investigate everyday scientific themes for 2-4-year olds. This amazing opportunity presented an even bigger challenge for us. This would be our first series for broadcast and project of this scale. As part of a mixed media production consisting of live action, 2D and stop-motion elements, we worked closely with the team at CBeebies to create all 2D character animation. The show’s scientific theme explored opposites such as ‘Light & Dark’ and ‘Big & Small’ for the first 26 episodes, and materials such as ‘Wood’ and ‘Metal’ for the remaining 26 episodes, including a Christmas Special ‘Snow’. Each episode contained three animated sketches, a live action investigation with character animation integrated, and a series of animated explorations over live action and archive footage. In addition to the bespoke animation per episode, we created a large library of re-usable elements such as wipes and dance loops that were used throughout. It was a complex production with a busy schedule, but it was nothing that we couldn’t handle. We provided everything from design and storyboard through to compositing and final delivery to the post production house, Timeline. We even had the opportunity to write four episode scripts for the animated sketches of the show. Here’s a clip showing the basic action and timings of the animatic compared to the final animation. Here’s a simple breakdown of our process of animation over the live action. We had the time of our lives making ‘Kit & Pup’. We rose to the challenge presented by our first series for broadcast by delivering consistently funny, charming and high-quality animation across all 52 episodes. 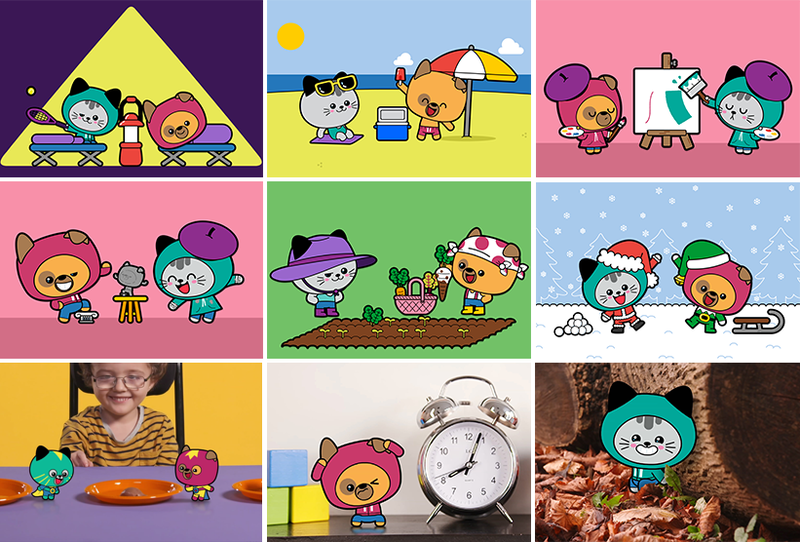 A super cute and graphical aesthetic with a slick and snappy animation style, ‘Kit & Pup’ has gone down a storm on BBC iPlayer and gained a majority share of the audience for its time slot. A dream project for 2018 and our fingers are crossed for a second series.